Stephen Gorove (1917-2001) was a space law education pioneer. He served as a professor of space law and director of space studies and policy, from 1991-1998, at the University of Mississippi. He organized the first North American international space law conference, which was held at the University of Mississippi in 1969. He founded and chaired the editorial advisory board for the first space law journal, the Journal of Space Law, in 1973. He served as the first director of the NASA-sponsored National Center for Remote Sensing, Air, and Space Law from 2000 until his passing. Born in Erendred, Hungary, in 1917, he graduated from the University of Budapest in 1939. After immigrating to the United States, he began his studies at Yale University. He received a master of laws degree and doctorate from that institution in 1950 and 1955 respectively. In 1957, Gorove married Margaret Beasley. They had four children: Katherine M. Gorove, Margaret C. Gorove, Stephen J. Gorove, and Michael A. Gorove. At Yale and Georgetown Universities he held research positions before beginning his teaching career at New York University Law School in 1954. Upon leaving that position in 1954, he taught at the University of Denver until 1965, when he joined the faculty at the University of Mississippi as director of the graduate law program. From 1981-1998, Gorove was a professor of law at the University of Mississippi School of Law, and from 1989-1993, he was director of space studies and policy. He developed the first regular space law course in American legal education, and built a core program at the University of Mississippi dealing with all aspects of space exploration. After the Moon landing in 1969, Gorove organized the first space law conference in North America on the Legal Implications of Man’s Landing on the Moon on the campus of the University of Mississippi. 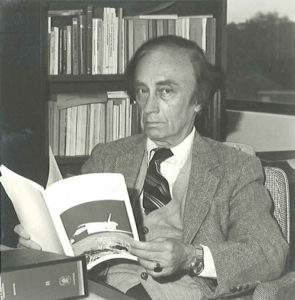 In 1973, he founded the world’s first space law journal, the Journal of Space Law.As an advocate of a central entity to address legal problems in space, Gorove’s scholarship in international and space law became a cornerstone of the NASA-sponsored National Center for Remote Sensing, Air, and Space Law, which opened in the University of Mississippi School of Law in 2000. He was a prolific lecturer around the world, he also served as a consultant to the Institute of Air and Space Law of McGill University. In 1958, Gorove addressed the first Space Law Congress at The Hague, and for many years, he represented the American Society of International Law before the United Nations Committee on the Peaceful Uses of Outer Space, and he was an active member of the International Astronautical Federation. In addition, he helped develop international treaties establishing jurisdictional boundaries and liability limits for space exploration and relevant issues, including effectuating regulations on NASA’s liability for property damage caused by falling space debris. Gorove served the International Institute of Space Law as a vice-president. A contributor to professional journals within his field, Gorove edited more than twenty books and was the author of Developments in Space Law: Issues and Policies (1991), United States Space Law: National and International Regulation (1982), and The Space Shuttle and the Law (1980). The American Astronautical Society and the International Institute of Space Law honored Gorove with distinguished service awards. In 1977, the World Congress of the International Astronautical Federation gave Gorove a testimonial for his contributions to the development of Space Law. In 1998, the University of Mississippi named their chapter of the International Law Society the Stephen Gorove Society of International Law in his honor. The Stephen Gorove collection contains 15 linear feet of personal correspondence and professional papers relating to Gorove’s prestigious law career and the establishment of the National Center for Remote Sensing, Air, and Space Law.